I wasn't especially impressed by Chicago-based black metallers Murmur when checking their debut album out, 2010's Mainlining the Lugubrious, prior to reviewing this – not because it was bad, but because it was the sort of modern yet fuzzy black metal release that's around a lot these days, and there was little personality shining through apart from the admittedly subtly disturbing drug-related artwork. One split with Nachtmystium followed the next year, then nothing until now – and it would be more than obvious that Murmur represents the band even if they hadn't chosen to self-title it. Heavily influenced by early King Crimson (there's a cover of Larks's Tongues in Aspic Part II on the limited edition) but retaining a link to black metal, early listens will be confusing. It's a flurry of percussion, eerie guitar lines and seemingly structureless, chaotic songwriting – black metal written as though it were jazz, in some ways, and the more you listen the more this makes sense as a summary. Noise rock and punk are also listed as influences in the promotional material, yet King Crimson making black metal is about as on the mark as it gets. It's an impressive album, but I'm confused at the marketing of it as actual black metal – it's far beyond black metal, and will appeal primarily to those interested in the more technical side of progressive metal. There is none of black metal's trademark 'evil' atmosphere, hardly any blastbeats – after the first song, very little that is recognisably black metal. Not that this is a bad thing, as the performances are all wonderful, particularly drummer Charlie Werber who is like some octopus-limbed technician, providing near-constant fills and trills to the music and the album is easily worth justifying listening to for his performance alone. Opener Water From Water is something of an intro, yet is six minutes long; almost freeform at first as the instruments noodle along abstractly, a song only emerges as it progresses into blasting black metal – the most black metal part of the album, and even then it's anything but traditional, guitars a blur and vocals a deranged shriek that has seemingly little to do with the music. 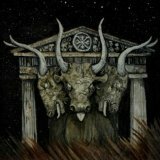 The following Bull of Crete takes more solid form with a chugging guitar line and drums that take definite structural shape behind the music; even the vocals are working with the music rather than against it. It builds up and explodes into what is practically jazz rock, reminding me more of deranged Rock in Opposition stalwarts Guapo than anything frostbitten from Norway. It's oddly atmospheric, especially when the vocals turn almost incantatory and you begin to feel like you've stumbled into some strange cult's rituals. Al-Malik and the two-part Zeta II Reticuli increase the tempo and makes the jazzy rock the focus yet spoil the flow rather with the dips into avant-garde meandering, and Recuerdos is an acoustic interlude that's several stages of technicality above any acoustic interlude you've heard before. And it all comes together on the closing cover of Larks' Tongues in Aspic Part II, which as the intelligent will know is King Crimson making this sort of music sound almost catchy – and here, Murmur make it heavier and gnarlier without losing that essential original oddness. I'd be lying if I said I liked this album – the abstract nature of the music often makes it a chore to listen to and even left me feeling strangely nauseous after one particular listen. But it's undeniably a work of talent, and a piece of prog that will interest many.